With the latest information on hybrid and alternative fuel vehicles. Hybrid vehicles are in their infant stages of development. Most all auto makers are now working on new developments. As a result, we are seeing many new types of operation, new modes of operation, new types of drive trains, and many different electrical voltages. There are also many types of Hybrid Vehicles. 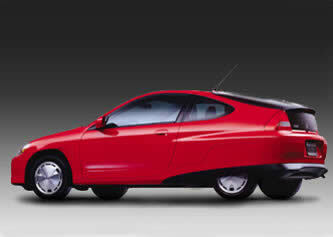 In December 1999 Honda Insight was the first gas/electric vehicle brought into the U.S. Since then many more have been introduced, each bringing in an all together different design. Hybrids can have a parallel design, a series design, or a combination of both. In a parallel design: The primary, or gas, engine is used for highway driving, an electric motor provides added assistance during hill climbs, acceleration and other periods of high demand. In a series design: The primary, or gas, engine is connected to a generator that produces electricity. The electricity charges the batteries, which in turn, drive an electric motor that powers the wheels. A series parallel: can also be built to use the series configuration at low speeds and the parallel configuration for highway driving and acceleration. Mild Hybrids: are a little different, GM uses a system in which the electric motor never propels the vehicle, it only has the capability of shutting off the gas engine and restarting it at a stop, and acting as a 120 volt AC generator. Today there are a lot of rumors, misunderstandings and misinformation out, about hybrid vehicles, that has created a great fear among emergency responders. 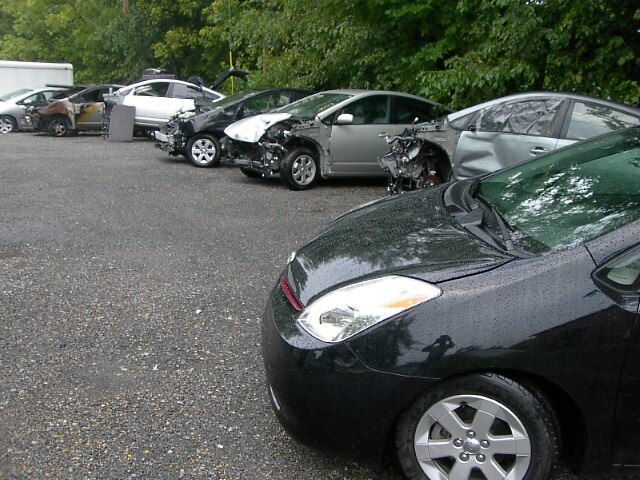 "Has anyone responded to a hybrid vehicle accident?" This is unacceptable for emergency responders! If we understand and practice a few safety measures. Hybrid Vehicles are no more of a risk than Conventional Vehicles. Hybrid vehicles, in fact, have a lot of safety factors built into them, many of these you will not see in this study. The reason being, responders many times rely on the built in safety factors that they have heard about. With all the pour information circulating and the fact that no two hybrid vehicles are alike, this can be very confusing. Some where down the line, injuries are emanate. If the guidelines in this general study are practiced on every scene, you should be safe in handling most any hybrid emergency scenario. Every mechanical part is subject to failure. Manufacturers have hundreds of recalls every year for failures that can cause injury or death. This is why we do not depend on built in safety. If we perform our proven steps of safety, then the built in features become an extra precaution to cover our human error. Honda Insight was the first gas/electric vehicle brought into the US in December 1999, since then many more have been introduced, each bringing an all together different design. Some standards were developed, such as the bright orange wires and connectors, indicating high voltage. As emergency responders, it is very important to our safety that we continually be aware of the major changes each year. One of these changes that drastically effects rescuers is that, from the introduction of hybrids vehicles, we have been taught to watch for any bright orange wires or components. Warning! Today rescuers must be aware that there are new color codes being used to identify electrical dangers. 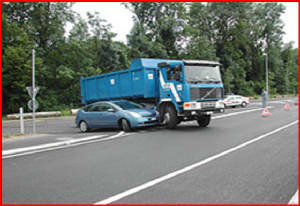 These operations are a must when dealing with hybrid emergencies. One of the biggest fears, is that of being shocked or electrocuted. Rescuers will not be shocked or electrocuted by touching the metal body or frame. Many instructors teach different sequences of performing these operations, but it has been our experience that the safest way to perform these is in the numerical order listed below. By using these eight steps --- in their order, we can safely deal with most any hybrid emergency. 3. Shift it out of gear or place it in park. 4. Turn off and remove the key (smart keys at least 25 ft). 5. Be sure the ready light or auto stop light is off. 6. Set the park brake. 7. Disconnect the 12 volt battery. 8. Never cut or touch the orange, blue, or yellow wires or connectors. Why must they be done in order? All hybrid vehicles, except Honda Insight and Toyota Prius, look exactly like their conventional counter parts. The only external identifying markings are very small emblems that must be observed by walking around the vehicle. These emblems can be easily overlooked especially at night, or the emblem can be missing as a result of the crash. Either way the rescuer would not immediately be aware that he or she is dealing with a hybrid vehicle. Every hybrid has an idle stop mode, some times called the sleep mode. Though the engine is not running, if the ignition key is on and the occupant has their foot on the brake, the vehicle is still fully operational. As you will see; if the occupant removes their foot from the brake or touches the accelerator, the rescuer could be run over, simply trying to identify the vehicle. Step number one: is to chock the wheels, with the wheels chocked the rescuer can safely walk around the vehicle, to accomplish step two, which is to identify the vehicle. In dealing with so many different technologies and their constant change, it is impossible for the rescuer to know every vehicle. We must find general procedures and habits that will work on any vehicle, no matter what it is or is not equipped with. In this case, a very good habit would be to chock the wheels on every vehicle before any other procedures are performed. In facing reality; old habits are hard to break, traditionally rescuers and EMS have exited the truck and grabbed the medical bag the first thing. Consider placing two chocks in the same box with the medical bags, not only making it handy, but immediately reminding the rescuer of the need for them. Our third step in securing the vehicle is to take it out of gear or put it in park; again emphasizing the need to chock the wheels first. If the rescuer reaches across the occupant to shift the lever, it is highly likely that the occupant will have some kind of a reaction, if that reaction included moving his foot off the brake or touching the accelerator, the rescuer could be dragged or run over. The fourth step; is to turn off and remove the ignition key. As you will find in the advanced sections, this one simple step, not only turns off the engine, but it isolates the high voltage to the HV battery, and on the Honda Hybrids it actually turns off the airbag system. Why is it so important that we take it out of gear before turning off the key? Many of today’s vehicles use either a joy stick type or floor shift type electronic shifter, instead of the conventional type, electricity is required to operate them. Step five is to; be sure the Ready or Auto Stop light is off. Rescuers, without failure, must visually check this light. If this light is illuminated or “ON” even though the engine is not running the vehicle is fully operational. Step six; Set the park brake. Many times, in an extrication type scenario, the park brake will not be immediately accessible, but if or when it is accessible, set the brake as an extra precaution against vehicle movement. Step seven; disconnect the 12 volt battery. Rescuers must perform this step, not only for the occupant’s safety, but their own as well. You will find in the technical information that by turning off the key we isolate the high voltage to the HV battery, but some vehicles are equipped with multiple 450 to 850 volt capacitors in the inverter, (under the hood). Disconnecting the 12 volt battery isolates this power from entering the HV cables. A second reason for disconnecting the 12 volt battery is that it shuts down the SRS or Airbag system. As mentioned before the Honda Hybrid‘s airbag system is shut down by simply turning off the ignition switch, but keep in mind that these are the only vehicles that have this feature. Step eight; never cut or touch any bright Orange, Blue or Yellow wire or component connected to it. Every hybrid and high voltage system is totally insulated and isolated from the metal body and frame of the vehicle. Multiple ground faults and voltage monitoring sensors are built into the systems along with high voltage fuses. Never depend on these systems. Remember our margin of safety factor. Manufacturers have routed the high voltage cables in areas that a rescuer should never have to access, in order to accomplish a successful extrication. Warning! Remember we have not removed the high voltage from the vehicle, we have only isolated it to the HV battery. Never open, cut, or handle the NiMH battery. Once we have performed these eight steps the vehicle is the same as any conventional vehicle. HV battery pack fire, by cooling the adjacent Ni-H battery modules below their ignition point. The remaining modules on fire, will burn themselves out. Click on the links below to enter our self study courses. These are in depth studies of each make and model of hybrid vehicle. These classes are in slide show form and may take 2 - 5 minutes to download, as they are very large files. These classes are under constant revision as information becomes available, so be sure to check them often.